Is your monthly phone bill outrageous? By switching to VoIP (Voice over Internet Protocol), DIS can save you up to 70% off your current phone bill. 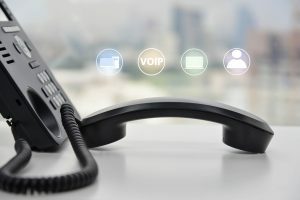 The unique aspect of this phone system is that all local calls between employees (regardless of location) are free due to over the Internet calls. Another benefit is that international calls cost a fraction of the amount charged by phone operators which results in lowering your monthly bill. Our Star2Star VoIP phone system has a hybrid based feature. This allows for the scalability of a Cloud based system with the reliability of an onsite PBX. Our Hybrid solution has multiple disaster recovery options and has a minimal use of Internet at only 40KBPS per call. With VoIP, you no longer are required to listen to your voicemail through your actual phone. All your voicemails will be sent directly to your email inbox which serves as a convenient tool for you and your company. If you are ever out of the office and need to listen to a voicemail, you can do so right through your email. No more missed calls! VoIP provides the ability of enabling Find-me/Follow-me features. If you are away from your desk and miss a call, you can set you can set your phone to transfer that call to your cell. You no longer have to worry about missing calls with this convenient feature. Are you tired of getting a bill every time you call for phone support? DIS Computers offers free unlimited 24/7 customer support so you no longer need to worry about that extra phone bill when you have a problem. We are currently offering a $250 Amazon Gift Card with the purchase of any VoIP phone system this month! Call us today at 440.838.4111 or email us today at info@discomputers.com for a free consultation!